Hmmm…. I may have to start studying soon… summer break ends in August and it’ll be the year of the SATs after that. The Book of Mountains and Seas was the compilation of all the information from the Chinese myths and stories. In it, one could find information on the Imugi. But even in a book like that, there lay no information about a red horned, black scaled Imugi, many times bigger than normal. Even the Guangya (廣雅), which rivals the Book of Mountains and Seas, contained no information on that type of an Imugi. A black scaled Imugi with red horns. It was a strange existence that had never been seen in the world until now. Cho Ryu Hyang sorted his thoughts as he clambered up the mountain. A formation was something created by man by bending the laws of nature to his will. Since it is not something made by god, living beings can not survive in a formation for long. But his teacher saw something alive. It didn’t matter whether it was a dragon or an Imugi. The fact that something lived inside a formation was amazing in itself already. He climbed higher as he thought that, and reached a place that had strange stones arranged all over the place. Cho Ryu Hyang approached one, and observed it carefully. From the shadows, there was someone watching him do all this. He served as one of the eight guardians of the church, and was also known as the Blood Sound Demon in the martial world. He was a fearsome man. A person like that, was currently buried in the ground with only his head poking out. He was observing Cho Ryu Hyang’s every move. This really wasn’t something to be happy about, the Pope selecting him. He didn’t know why, but the Pope told him to not get within 900 meters of the boy. Burrowing (土遁術: A technique to move faster in the ground). Ju Sang San felt despondent. He had to crawl along the ground like his life depended on it, in order to use this technique. Ju Sang San had even reconsidered taking the mission, taking into account the shameful position he would have to take. But whose order was it? The Pope’s orders were absolute. Plus, was he not serving the Pope’s first disciple right now? This mission was something to be proud of. There was nothing shameful about this at all. Ju Sang San strengthened his weakening resolve, and wiped sweat off his face. He became as quiet as possible, and observed the young man in front of him. He knew what the symbols on the stone meant. They were mathematical symbols that were in use a long time ago. Those symbols were interlaced to look like a beautiful pattern etched onto stone. Cho Ryu Hyang had no idea how they were made, but the symbols were glowing. Cho Ryu Hyang calmly began to translate the symbols. He soon realized that they were not as hard as he had first thought. They were not in much use in this day and age, but as long as you knew them, translating them was not hard at all. Cho Ryu Hyang’s eyes brightened once he finished translating a part of the symbols. Someone, someone from the past, created a language using mathematics, and had done so using a way that was very similar to his teacher’s method.. Since he already knew something like this before, he didn’t encounter too much trouble. Once he realized what it all was, everything became easy. He could instantly translate everything else that was written on the stone column. Stones such as these often talked of things like the Imugi. A snake that failed to transform into a dragon. That was an Imugi. Formations are usually described using metaphors, but apparently, this time it was not so. Cho Ryu Hyang paused at the last sentence. There was something in the last sentence of the column that caught his attention. When Cho Ryu Hyang thought that, he heard someone laughing in his mind. Zhuge Liang. He was laughing. Zhuge Liang didn’t respond immediately to Cho Ryu Hyang’s question. But the old man did seem very amused. The reason he was talented? What did that mean? When Cho Ryu Hyang put on a confused expression, Zhuge Liang spoke. Zhuge Liang paused, and then spoke whilst gazing affectionately at the stone in front of Cho Ryu Hyang. Now, what did that mean? Cho Ryu Hyang was waiting for an answer, but Zhuge Liang did not continue. He simply stared at the stone for a long time, and then spoke with a faint smile. Cho Ryu Hyang realized something. Zhuge Liang didn’t respond. He just fingered his feathered fan, and smiled. 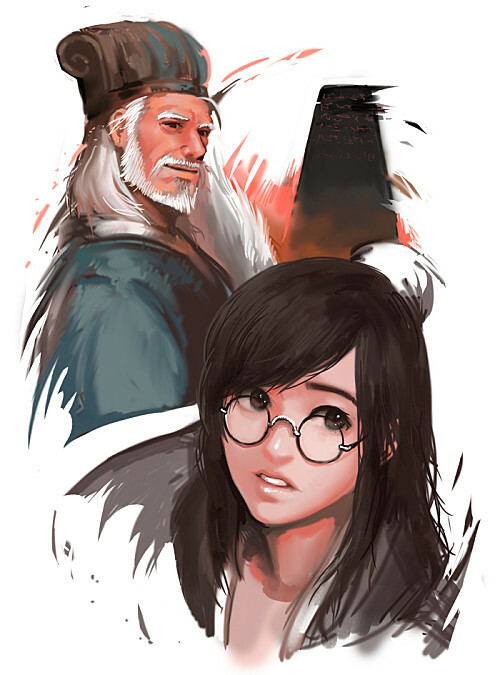 Cho Ryu Hyang was convinced that the old man knew something, but he did not press further. Zhuge Liang. The old man’s words were right. No matter how much he thought about the formation, the answer wouldn’t come to him. He had to go into the formation, and find the answer for himself. A bird surprised by a bow (傷弓之鳥). It meant that once someone was surprised by something, he/she would again be surprised by something similar. It seemed that Cho Ryu Hyang had become overly cautious after his suffering inside the formation that he had created a while back. Come to think of it, this was different from what happened before. He wasn’t afraid of what was inside. After all, Cho Ryu Hyang had the weapon known as ‘Mathematics’, didn’t he? Cho Ryu Hyang steadied his breath. He could see an entirely new world laid out in front of him. Cho Ryu Hyang began to walk into the formation. The Dao Emperor, Baek Mu Ryang. He stared at this young junior brother of his, then smirked. Was he in his thirties? The man in the white clothing and the white bandana spoke impudently.. The two stars that support the whole of the Alliance. One was a star high up in the sky, the Dao Emperor Baek Mu Ryang. The other was a star in the mountains that calmly gathered light, the member of the 15 guests, the Lion Sword King (獅子劍君). The man’s name was Yu Sul Bin(柳雪玭). A man who hated evil, and valued justice. Unlike Baek Mu Ryang, he nurtured four children as the core disciples of the Alliance. Unlike his appearance, which made him look like he was in his early thirties, he was actually a harmonious expert in his fifties. The Lion Sword King did not go outside a lot. At least, ‘publicly’ he didn’t go out. He was the hidden sword of the Alliance. The man who would lead the Alliance after Baek Mu Ryang retires. Yu Sul Bin grinned and shook his head. Yu Sul Bin made a face of ‘Sure, I’ll be generous for once.’ towards Baek Mu Ryang. Seeing that, Baek Mu Ryang laughed loudly, and shook his head. Yu Sul Bin’s playful face suddenly turned serious. Sometimes, he went outside in order to perform ‘unofficial’ missions. He came all the way here for the same reasons. But this mission was a little different from ones in the past. Usually, he would be debriefed on the mission before the trip, but this time, everything was extremely secretive. Baek Mu Ryang faintly smiled. Now that his strongest weapon was ready for use, the way he would use it would either bring great profit to the Alliance, or it wouldn’t do anything at all. Yu Sul Bin’s eyes sparkled. Yu Sul Bin grinned at Baek Mu Ryang’s words. Right. As long as it was for the future of the Alliance, he could do anything. Baek Mu Ryang rubbed his chin, and spoke. Yu Sul Bin was quite proud of his name. That was because he believed that a name was something that represented a person’s worthiness. Baek Mu Ryang, knowing that, nodded. Yu Sul Bin made an excited face. He was sad that he wouldn’t be able to fight in the battle, but he received an important mission. What was the mission, then? Baek Mu Ryang didn’t reply immediately. This was because of the man’s habit of pausing before saying important things. The ‘secret’ retrieval of the Moon Edge blade Technique. That was the mission that Yu Sul Bin received. Behind the front that was the Alliance-Demon war, a secret plan was thus being hatched. This series is so good! Thanks for the chapter! there was not enough on Cho Ryu Hyang! Thanks for the chapter ensj and editors (are there any? I’m confused 😦 )! There is an editor. His name is Kiyara (I keep forgetting to do the “Edited by” part in chapters D:) I think he came in somewhere around chapter 23? Thank you so very much for all your hard work!!! I love this one with unholy love!!!! Also, don’t work too hard!!! Tank you for the chapter.